South Korean electronics firm Samsung's Galaxy S3 has outsold Apple's iPhone 4S for the first time, becoming the world's best-selling smartphone, says research firm Strategy Analytics. 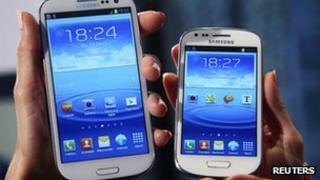 Samsung sold 18 million models, compared with Apple's 16.2 million sales, in the third quarter of 2012. The Galaxy S3 "has proven wildly popular with consumers and operators," said Strategy Analytics' Neil Mawston. However, Apple's new iPhone 5 is widely expected to reclaim the top sales spot. Strong Galaxy smartphone sales helped Samsung report record profits in the three months to September. Net profit was 6.5tn won ($5.9bn; £3.7bn), up 91% from a year earlier. But analysts say that one reason Samsung's phone was able to wrest the top sales spot from Apple's iPhone 4 was because many customers were waiting for the iPhone 5, which was launched during the third quarter. The Apple iPhone 5 has already got off to a solid start and "we expect the new iPhone 5 to out-ship Samsung's Galaxy S3 in the coming fourth quarter", said Neil Mawston. "Apple should soon reclaim the title of the world's most popular smartphone model," he added. Samsung and its rival Apple have been locked in a series of ongoing legal battles over patent infringement claims in various countries. In October, sales bans in the US on Samsung's Galaxy Nexus phone and its Galaxy 10.1 tablet computer were lifted, in a blow to Apple. Meanwhile, earlier this year, a US court awarded Apple $1.05bn (£652m) in damages, after ruling several of its software and design technologies had been infringed by Samsung. Samsung has challenged that verdict and called for a retrial. Analysts say that given the tremendous growth potential of the sector, the two firms' legal battle is likely to continue.